MASCOT’s German science team has released a summary of the lander/hopper’s results and seventeen hour journey across the surface of the asteroid Ryugu. The image on the right, reduced and cropped to post here, shows the spacecraft approach, landing, and numerous hops across the surface. If you click on the image you can see the full high resolution image. Having reconstructed the events that took place on asteroid Ryugu, the scientists are now busy analysing the first results from the acquired data and images. “What we saw from a distance already gave us an idea of what it might look like on the surface,” reports Ralf Jaumann from the DLR Institute of Planetary Research and scientific director of the MASCOT mission. “In fact, it is even crazier on the surface than expected. Everything is covered in rough blocks and strewn with boulders. How compact these blocks are and what they are composed of, we still do not know. But what was most surprising was that large accumulations of fine material are nowhere to be found – and we did not expect that. We have to investigate this in the next few weeks, because the cosmic weathering would actually have had to produce fine material,” continues Jaumann. The spacecraft apparently bounced eight times after first contact, then executed three hops. The rubble pile nature that is observed I think explains why the Hayabusa-2 science team decided to delay its own landing for a few months so they could figure out a plan. 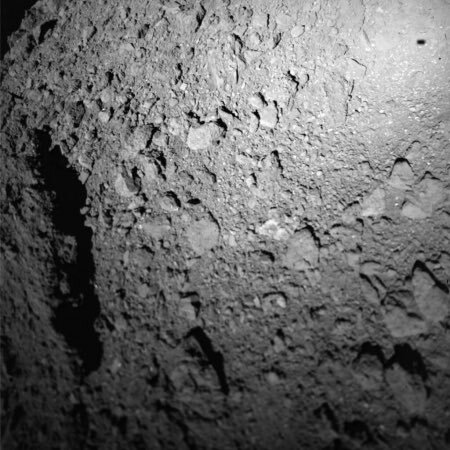 It really appears that Ryugu does not have any smooth flat spots, as expect. 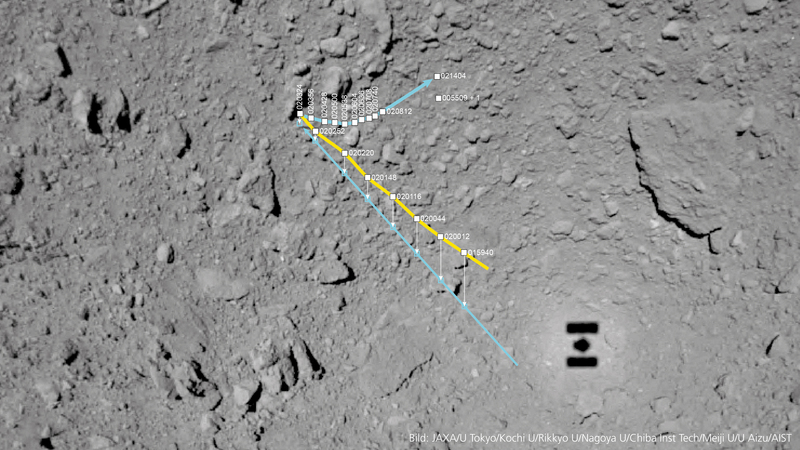 The Hayabusa-2 science team today released images taken of MASCOT as it descended to the surface of Ryugu, including images showing where it landed. In the image on the right, reduced slightly to post here, you can see MASCOT as it slowly moves downward towards the asteroid shortly after its release from Hayabusa-2. At the link there is another image showing the mini-lander as a white dot when it was still about 115 feet above the surface. Other images show its location on the surface where it operated for seventeen hours and completed three hops. The next big event from Hayabusa-2 will be the spacecraft’s own landing, sometime later this month. Hayabusa-2’s mini-lander MASCOT has ended its mission on Ryugu after seventeen hours, slightly longer than the planned sixteen hours. The lander made one hop, and successfully transmitted all its data back to Hayabusa-2, which still has one more mini-lander on board that will be sent to Ryugu’s surface, probably after Hayabusa-2 makes its own landing. Meanwhile, the two Minerva-2 bouncers continue to operate on Ryugu. Update: The image at right, reduced to post here, was taken by MASCOT during its descent. You can see the spacecraft’s shadow in the upper right. If you click on the image you can see the full resolution version. Original post: The German/French-build mini-lander MASCOT has been successfully deployed by Hayabusa-2 and has successfully landed on the asteroid Ryugu. MASCOT came to rest on the surface approximately 20 minutes after the separation. Now, the team is analysing the data that MASCOT is sending to Earth to understand the events occurring on the asteroid Ryugu. 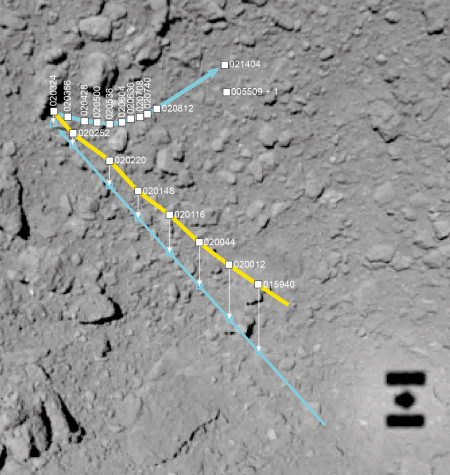 The lander should now be on the asteroid’s surface, in the correct position thanks to its swing arm, and have started to conduct measurements independently. There are four instruments on board: a DLR camera and radiometer, an infrared spectrometer from the Institut d’Astrophysique Spatiale and a magnetometer from the TU Braunschweig. Once MASCOT has performed all planned measurements, it is expected to hop to another measuring location. This is the first time that scientists will receive data from different locations on an asteroid. The spacecraft took 20 pictures during its descent, which were beamed to Hayabusa-2 where they are presently stored. Engineers have begun the deployment sequence for Hayabusa-2’s MASCOT lander, with deployment planned for tomorrow. Right now Hayabusa-2 is slowly moving closer to Ryugu, with live images appearing about once every half hour. More information about MASCOT can be found here. The lander can also hop like the MINERVA bouncers, but it can only do it once. Its battery life is about sixteen hours, so once it is deployed it will only operate on the surface for a short while. Both the MINERVA and MASCOT mini-landers are mostly engineering tests for using small cubesat-sized spacecraft as probes. So far the MINERVA bouncers have been an unqualified success. Hopefully MASCOT will be as successfully. At a press conference yesterday the Hayabusa-2 science team laid out their landing schedule for the spacecraft and its three tiny landers. The first lander will be one of its two tiny MINERVA-II probes, and will take place in September. This will be followed by the German/French MASCOT probe in early October, followed in turn in late October by Hayabusa-2 itself. The landings of the first two probes will help them pick Hayabusa-2’s landing site, as well as the site for last MINERVA lander. 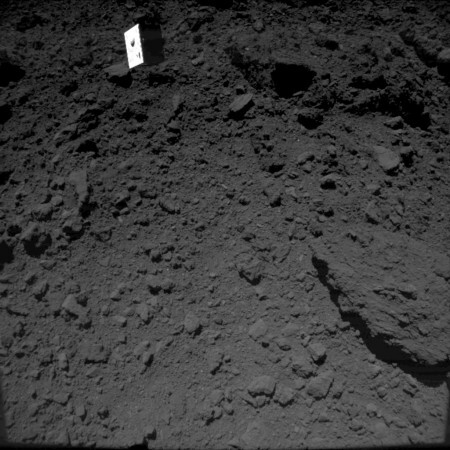 It does appear that the boulder-strewn surface is posing a problem for the engineers.